Bitter~Sweet ™: Positive vs Negative Reinforcements . . . Positive vs Negative Reinforcements . . .
Pete and I were at the mall this weekend to buy some proper running shoes. (I know! Running? Me? What the heck? I won't say too much, because the minute I do I'll jinx myself and the desire to ever run again will quickly leave me. Although now that we've sunk money into good shoes for both of us, we have an extra incentive not to flake out.) *ahem* Anyway, we were at the mall to buy running shoes when this sign by the food court stopped me in my tracks. Diabetes? A heart attack could be right around the corner. To be honest, I felt like someone was kicking me when I was down. My disappointment must have been pretty apparent, because Pete suggested I snap a picture with my iPhone and write a post about it. 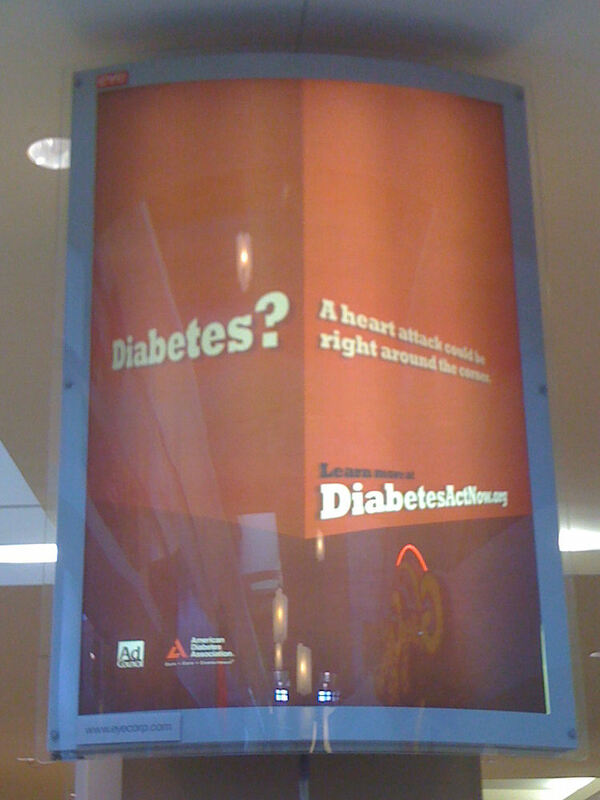 I don't know if you can see it in the sign, but the web-site advertised is DiabetesActNow.org. If I hadn't taken the picture and decided to write this post, I know seeing this sign would never have prompted me to visit the site. That's a shame, because it is a pretty slick site. It has two main focuses - information or "simple answers", and tips or "easy actions". I found the content a bit basic for me, but I can see it being a great tool for the newly diagnosed or for someone who has ignored their diabetes for years but is ready to start over. At the end of each "easy action" video is a button marked "I'll Try It". If you click that you can sign up for email reminders and access to your own Easy Action page where you can track your progress. All in all, I can see the value of this site. I also appreciate the education this sign is trying to bring, but I can't help wishing such a positive web-site had reached out with a more positive sign. I understand that some feel scare tactics and the shock factor are great attention-getters. They may be, but the idea of a heart-attack jumping out at me from behind the next corner is not going to motivate me to visit an advertised site. I'd rather see an image of a person putting some of their "easy action" tips to use and taking positive steps to prevent heart disease. Something like that is more apt to put me in information-seeking mode. What do you think? Was I just cranky that day and over-reacting to the sign? Are negative reinforcements worthwhile for the attention they generate? Or do we need to start demanding more positive reinforcements? Are you tired of feeling like diabetes ads love to kick us when we're down? Yeah, that sign royally pisses me off. I don't know who thinks advertising like that is a good idea. Are they even considering how someone who has had diabetes a while and is knowledgeable and in good health might feel? Like nothing they do matters? Like no matter how well they care of themselves, tragedy is still right around the corner because they are still diabetic. Pure crap if you ask me. ARGH! I do not like scare tactics. That is why I've been glad to help with the American Heart Association's Heart of Diabetes campaign. One of our local TV stations does a health fair every year with basic bloodwork for a small fee. This year's theme is PERFECT. "Own Your Health". That is much more positive. I don't like scare tactics either. I had the most scary things happen to my father right before my eyes and those things I put in the very back of my mind, to NOT remember that they can happen to me. Yes we need to know what "can" happen but to use it as a tool to scare people or force people to take care of themselves, no it's not the best idea in my opinion. You're not alone in thinking that positive reinforcements work better than the negative ones. Totally agree. You could just as easily post a sign that says "Person? A heart attack could be right around the corner." Yeah, it's true, but it's not very helpful. Even if they want to get your attention with something dramatic like that, there should be an indication that they're offering a solution, and a solution that's NOT scary. As it is, it makes you feel like if you go to the site, you can find out more horrible things that might happen to you. Clearly not designed by a diabetic. Scare tactics are so draining when you're dealing with a lifetime situation. I have cut back on my news attentiveness because I don't want to have my sense of fear artificially raised all the time. Same deal here. I'm working really hard to manage my diabetes so I can live a long, healthy, happy life. I guess I am trying to prevent turning that heart attack corner, but that's not how I think about it. Argh. I'm getting incoherent; sorry. Anyway, I'm with you. I agree with you. What a bummer. Why not just wear a sign around our necks! 1- I don't like the trying to scare to visit a site. 2-Relatives and others will see that, that aren't as educated, and will then worry about me more. Like everyone has said, scare tactics are no good for me. In fact they breed rebellion in me. I need positive encouragement. I would have responded the same way you sidI think. Sometimes pretty makes a difference . . . Here WEGO to Boston . . .
No hard feelings . . .
Out into the World . . . .